A better-quality version of the video can be found on Youku (PR of China) here. 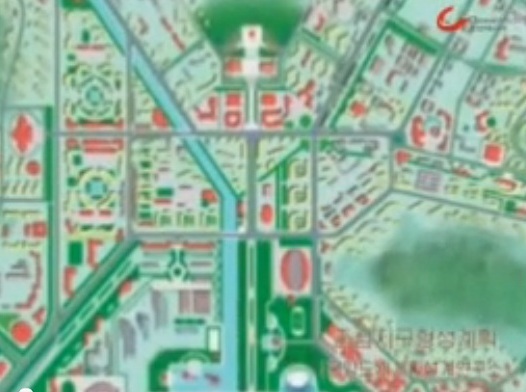 The video begins with a quote by Kim Il-sung who insists that the DPRK needs to make Rason better than Singapore after-which it elucidates the viewer as to how this task will be accomplished. Part one of the video focuses on the reconstruction of downtown Rajin, where a broad new north-south boulevard lined with new housing and facilities is set to become the new city center. The image on the left is an old one archived on my computer so I unfortunately don’t know the date. 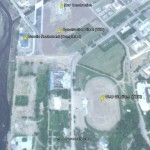 The image on the right is from Google Earth and was taken on 2011-6-19. 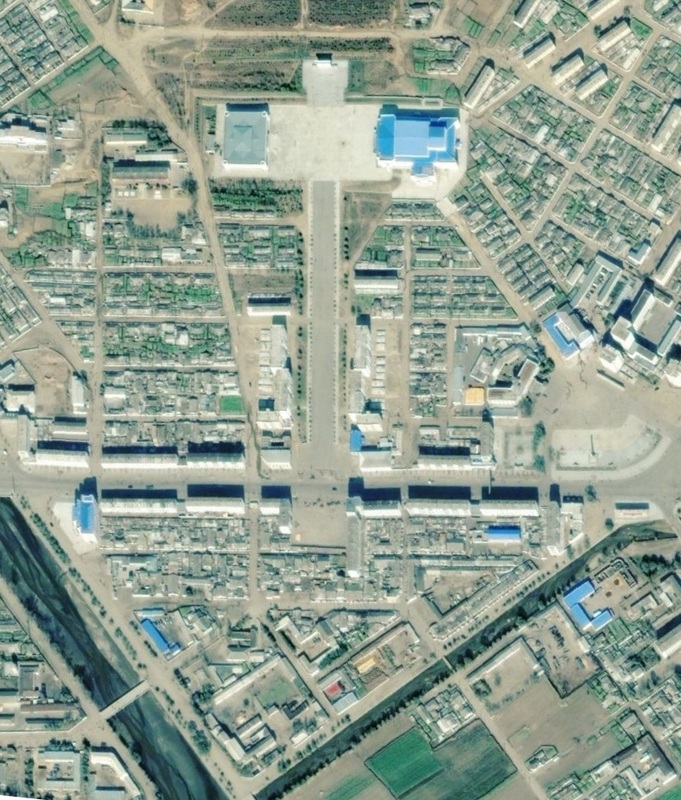 The recenlty released Google Earth image actually predates the release of the North Korean video–so this is what the city looked like when the video was made public. Unfortunately I have not yet seen any new tourism photos from this area to determine if construction has continued to the present day. Many houses have been demolished to make way for the new road, and I am not sure to where the dislocated families have been moved. If progress continues, however, many more Rajin residents can expect to see their homes demolished to make way for new high-rise apartments. 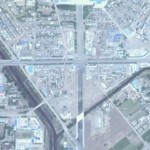 To see a good example of the urban transition, look at what happened in Ryongchon. The Rajin Noodle Restaurant has long been completed. A new project to the north-east of the restaurant has been launched. I am not sure, but I believe it is either a new library or health complex. South of that is a construction site that has not yet been launched. 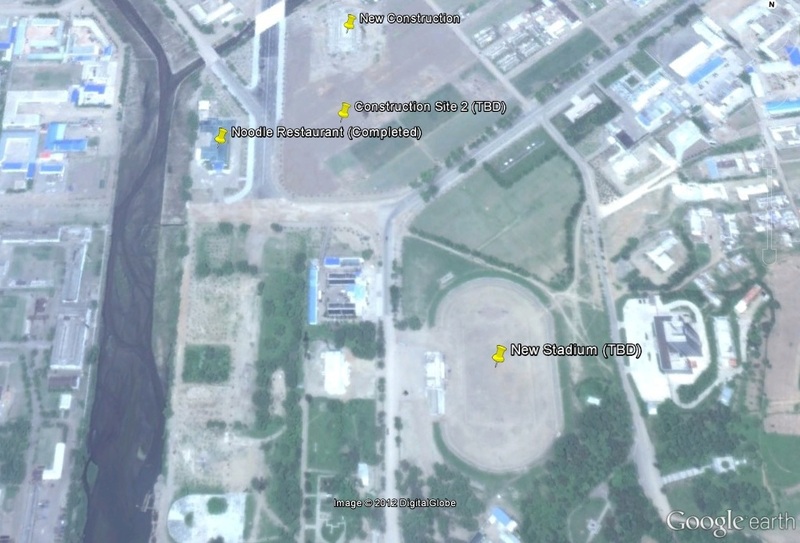 The video also shows a large new stadium scheduled to replace Rajin’s humbe sports field and gymnasium. This work does not appear to have begun either. If any readers can understand the video and pass along any helpful information I would appreciate it. In general, these are three main characteristics of their urban plan which I gather from the video. Like any typical urban master plan, Rason is divided into various zones: commercial, leisure, residential, distributed according to its geographical characteristics of hilly regions and the sea. There is a great emphasis on the long axial roads meeting at roundabouts which are filled with monuments and civic buildings. I believe this is largely influenced by their urban plan for Pyongyang which is planned according to early 20th century socialist urban model. In principle, it is should be efficient for vehicular movement and transportation of goods. The urban plan is also built upon a visual narrative of the harmony between the mountain and the sea where the buildings are designed and placed strategically to provide a 3-dimensional effect‘입체감’ (a term that is constantly repeated throughout the video). 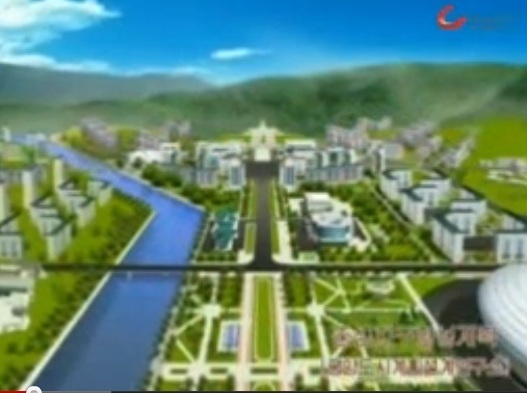 Aesthetics aside, Rason’s urban plan seems to be quite basic, it lacks the dynamism of other new SEZs, research parks that are currently being developed. Increasingly, cities are becoming more complex and developing the software infrastructure (data cables, monitoring systems, green technologies, etc) are becoming as equally important as developing the physical infrastructure (buildings and roads). New business parks like Songdo in Incheon are fully wired up jointly by IBM and Cisco. Urban planning and management has become a thriving business for tech companies like Siemens to construction conglomerates like Bechtel which offer one-stop solutions from financing to construction and layout grids for the city. While Rason is far less sophisticated than Songdo, but in order to be a well-functioning SEZ, it needs to consider and provide better urban management systems beyond physical infrastructure. Rason would need to consider the project on a longer term basis since the urban infrastructure provided today will have economic ramifications in future. For example, to rewire or install new technological infrastructure in future would cost much more than planning for future expansion. Perhaps, it will be interesting to uncover their plans for these ‘soft’ infrastructures together with the organisations (multidisciplinary conglomerates) that would invest in them. However, luck isn’t on Rason’s side, its development might be hindered by its geographical constraints. It is locked within hilly ridges and to pipe cable infrastructure to it might be costly and it also prevents future expansion of the city. As such, there are many hurdles for Rason to cross before becoming a well-functioning city. 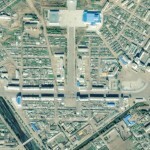 UPDATE 2 (2012-10-18): Calvin Chua offers more data in this post on the Choson Exchange web site. 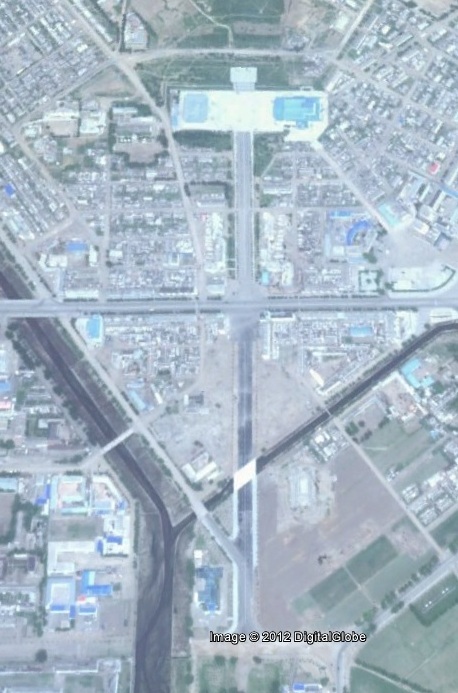 This entry was posted on Wednesday, July 25th, 2012 at 11:32 am and is filed under Architecture, Construction, Rason Economic and Trade Zone (Rajin-Sonbong), Real estate, Special Economic Zones (Established before 2013). You can follow any responses to this entry through the RSS 2.0 feed. Both comments and pings are currently closed. I think that only Chinese and Russians go to Rason. If you search in one of those languages you should be able to find videos. Curtis doesn’t speak Chinese or Russian. He’s an American after all.